After a highly unusual two-week absence, Donald Trump is about to return to Fox News. Trump, the GOP frontrunner, will be interviewed by 8 p.m. host Bill O'Reilly on Tuesday and 10 p.m. host Sean Hannity on Wednesday, a Fox spokeswoman confirmed. Behind the scenes, there are two questions: did Fox freeze out Trump for attacking 9 p.m. host Megyn Kelly, and if so, why is there a thaw happening now? Sources on Fox's side and Trump's side are telling different versions of the story. Tensions have been high since Fox's Republican presidential primary debate one month ago, when Trump balked at some of the questions, particularly Kelly's question about his treatment of women. Trump repeatedly criticized Kelly and Fox as a whole, which aggravated the network's chairman and CEO Roger Ailes. At one point Trump even seemed to suggest that Kelly was menstruating, although he denied saying that. The situation was exceedingly sensitive for Ailes. Trump is an unpredictable and powerful force in GOP politics and he was, until the debate, a regular guest on Fox, the favored news channel of the GOP. The two men spoke in the days after the debate and struck a fragile truce. Trump resumed his appearances on Fox News shows. But from time to time he has continued to criticize Kelly. When she went on a pre-planned vacation, Trump speculated that she'd been benched by Ailes. A Fox spokeswoman whacked him for buying into "conspiracy theories." But the detente held until August 24, the day Kelly returned from that vacation. 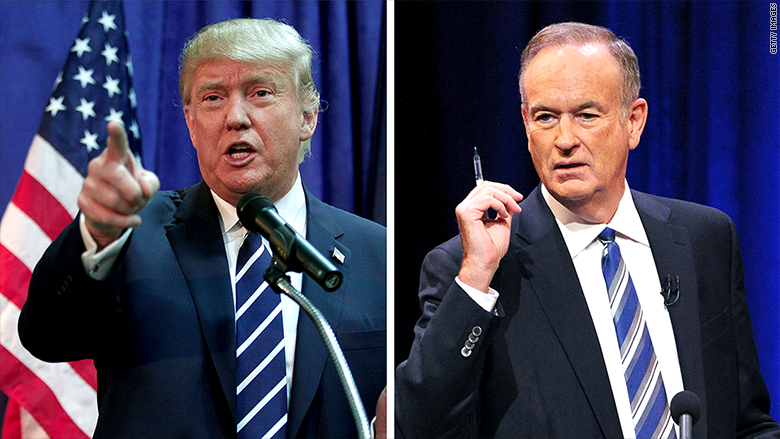 In the 8 p.m. hour Trump was a guest on O'Reilly's show. In the 9 p.m. hour Kelly was back on the air, and Trump immediately lambasted her on Twitter, saying he liked the show better without her. He retweeted fans of his who called Kelly a "bimbo" and a "waste." Ailes had issued prior statements of support for Kelly, but this time he decided to go a big step further. In a full-throated statement he said: "Donald Trump's surprise and unprovoked attack on Megyn Kelly during her show last night is as unacceptable as it is disturbing." He rejected Trump's "verbal assaults," said Fox would be undeterred by Trump's bullying and called for an apology from Trump. Since then, Trump hasn't been interviewed by anyone on Fox. During the two-week period, Trump has been interviewed multiple times by Fox's competitors, including CNN and MSNBC. He has also spoken with outlets as varied as the Washington Post, the "Today" show, the Economist, "Good Morning America," The New York Times, and a fledgling cable channel called One America News Network. So what happened? A source close to Ailes says he signaled to his shows that Trump was persona non grata for a little while. While hosts like O'Reilly and Hannity were eager to have Trump on -- he's a newsmaker and a ratings magnet -- they had to wait. From the Fox perspective, Ailes' message was conveyed loudly and clearly. And the network's ratings remained steady without any Trump interviews. But there's another perspective to consider. A source close to Trump says the candidate actually has been invited on Fox, repeatedly, since August 24, but that the campaign has declined. The source cited scheduling reasons. Since Ailes' blistering statement, Trump has mostly refrained from complaining about Kelly or Fox, though he has sent several tweets about specific Fox guests, like Karl Rove (a "dope") and Meghan McCain ("angry and obnoxious"). In an interview with Howard Stern the morning after his tweetstorm about Kelly, Trump said Ailes is an "amazing guy." When August's ratings came out and Kelly was in first place, Trump retweeted the news and said "Megyn, say 'thank you Donald!' Fox News also should say 'thanks!'"